We had a visitor from New Zealand stay with us this summer. While he was here he took a course on building in the Timber Frame construction style. 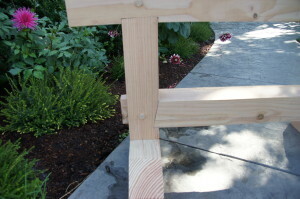 This involved heavy beams, mortise and tenon joints and lots of measuring. His biggest frustration was the measuring. As he is from a metric nation, he had a very hard time with our system using inches and feet. He had a hard time imagining what a 1/16 of an inch was and if 3/8 inch was bigger or smaller than 7/16. With some work, he was able to finish the work and they came out great. Students in school will be facing a similar challenge, but perhaps in reverse, as they will once again be meeting the metric system in their science classes. In some ways the U.S. Customary system of weights and measures is much worse than any other countries. 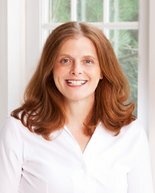 We are stuck with a Frankenstein’s monster of measurements that involves a mishmash of systems from many different sources. We buy gasoline by the gallon, but soda by the liter. Athletes play football on a 100-yard field, but they run the 100 meter dash in track and field. We measure in fractions of an inch, until things get very small and then we use decimal measures, such as thousandths of an inch. This is the topic of an article I wrote for the December 2014 issue of ChemMatters magazine. 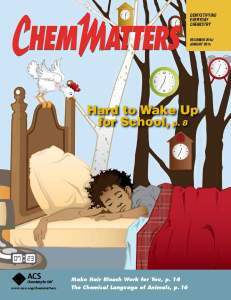 ChemMatters is an award-winning magazine for high school chemistry, which aims to explain how chemistry works in our everyday lives. Each issue includes a Teacher’s Guide containing background information, follow-up hands-on activities, classroom demonstrations, and other resources to facilitate student comprehension. In my article “A Measure of Confusion” I follow some the issues surrounding our current system of measures, including the loss of a NASA spacecraft that crashed instead of landing on mars. This was due to an incorrect conversion from English to metric units. By the way, if you join the new American Association of Chemistry Teachers (AACT), you will receive a one-year subscription to ChemMatters as part of your membership. And there is nothing confusion about that! We’ve all heard the adage “think globally, but act locally”, but for all the lessons presented to students in science classes, teachers sometimes fail to apply the same lessons in their everyday lives. Such is not the case with Sally Mitchell, a chemistry teacher and ACS ChemClub advisor at East Syracuse – Minoa High School. Earlier this month, as she was driving to Hancock International Airport in Syracuse, N.Y., she noticed a new electronic sign welcoming travelers to the area. It showed the current date, time and the temperature. But Mitchell was discouraged to see the temperature in Fahrenheit only. Mitchell is an advocate for the metric system. As with most science teachers, the majority of measurements made during her class are in the metric system, which is used by scientists worldwide. But Mitchell is not content to just teach her students the metric system. She wants to convert the entire United States to using it, instead of our traditional, but antiquated U.S. Customary System of weights and measures, which is used widely in consumer products and manufacturing. This, despite a law passed in 1988, which made the metric system “the preferred system of weights and measures for U.S. trade and commerce”. After seeing the new sign at the airport, Mitchell immediately called the mayor and the executive director for the airport. She made her case to have the sign read in Celsius as well as Fahrenheit. Happily, the authorities responded in a positive way. 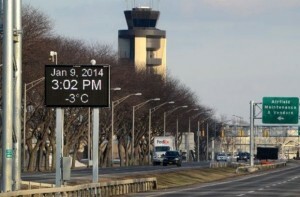 The airport agreed to reprogram the sign, and when it is done, it will display both the Celsius and Fahrenheit degrees. So while the U.S. may still be out of step globally when it comes to the metric system, at least one local action moved us a bit closer, which is very cool, no matter how you measure it.